Sony KD-43XF8505 review | What Hi-Fi? As manufacturers continue to push punters into super-sizing their lounge TVs, smaller models have been somewhat neglected. We’re not even talking about genuinely small TVs here. Depending on the manufacturer, getting flagship tech and features means buying at least a 49in or 55in model – and for some people that’s simply too big. In the case of Sony, if 43in is your limit, the most advanced model you can buy is the KD-43XF8505, which boasts a number of features from the 49in-plus XF9005 but ditches the local-dimming, direct-LED backlight in favour of LED backlighting from the edges. 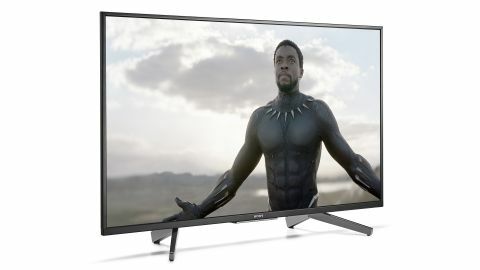 This turns out to be a poor decision, because, while the XF8505 is in some ways one of the best TVs in its class, its backlight badly lets the side down. The XF8505 is a rather handsome set, particularly by the standards at this size. It shares the splayed stance of the XF9005, but the arched feet make it look less awkwardly flat-footed. The bezels are thin, black and unadorned, but for a small logo and a white light that can be dimmed or turned off entirely. All of which means the TV would disappear in a darkened room were it not for that backlight. Having the LEDs for the backlight dotted around the edges rather than right across the whole screen does at least mean the set can be a little thinner. This is no super-slim OLED, but at 5.8cm it’s plenty slim enough and looks neat and tidy when wall-mounted. Around the back, you’ll find four HDMI inputs, two of which can handle 4K HDR signals (HDR10 and HLG are supported), three USB sockets, ethernet, aerial and satellite (but not Freesat) connections. Google’s Android TV brings with it a comprehensive selection of apps, including Netflix and Amazon Video (in 4K and HDR), Google Play Movies and TV (in 4K but not HDR), Rakuten, Spotify, Plex, VLC, BBC iPlayer and My5. Android doesn’t have ITV Hub or All 4 apps as standard but, by adding YouView, Sony has made accessing catch-up content a simple scroll back in time via the EPG. Android is generally getting better with each update, but while the XF8505 benefits from the improvements to presentation seen on other new Sonys, it suffers quite badly with stutter and lag. Sony’s flagship models, such as the new AF9, are starting to perform relatively slickly, which suggests the problem could be the X1 processor rather than the X1 Extreme of the higher-end sets. Either way, in use the XF8505 can be a bit irritating, with jerkiness through menus and long pauses in certain situations – at one point we waited over 30 seconds for the Picture menu to appear after a button press. Kicking off with current test favourite Guardians Of The Galaxy Vol.2 on 4K Blu-ray, there’s a fair bit about the Sony’s performance that’s pleasing. For a start, colours are rather lovely. There’s a richness and vibrancy at play that’s really enticing, but it’s not in the slightest bit overdone: whites are pure, skin tones are natural and subtle shades are lovingly recreated. Detail levels are high, too, and while the image isn’t quite as sharp as that of last year’s Award-winning Samsung UE40MU6400, it’s nicely defined in its own right. It’s also a bright image – much more so than its rivals at this size – and that would make it a perfect foil for an HDR movie such as this, were it not for the fact that the set is completely incapable of producing anything even approaching black to act as a contrast. Essentially, if there’s anything even a little bright on the screen, the backlight makes everything else grey. Unsurprisingly, this is most obvious in the bars to the top and bottom of a widescreen film, but any image that combines light and dark elements is left looking hazy – and that’s a big problem for a film with so much space-based action. It’s also a problem when we drop down to the 1080p Blu-ray of Logan, with the scenes that take place inside Wolverine’s near-windowless hideaway being the wrong kind of gloomy thanks to the lack of black depth. This upscaled image is a bit softer than others manage, too, and once combined with the limited contrast results in a relative lack of three-dimensionality. Colours are once again lovely, though: the green peppers and yellow squashes in the bowls combine nuance and vibrancy, and the copper plate shimmers in warm, metallic style. And while some tellies make Logan’s shirt look as though it’s just come out of a Daz commercial, the Sony reveals it to be grimy with dust. Sony has long set the benchmark for motion processing, and while the XF8505 isn’t perfect in this regard (fast, challenging motion can result in visible artefacts), it’s a step up from most TVs this size. We drop another level of resolution and the Sony is surprisingly impressive. The issue of black depth remains, but our Dirty Harry DVD is otherwise sharper and more detailed than it is when displayed on rival sets, while colours and motion remain as good as expected. Those traits translate to standard-def content viewed via the Freeview tuner. In short, if your TV diet still consists of more SD than HD or 4K, you might be prepared to overlook the lack of black in an otherwise excellent performance. When it comes to gaming, the XF8505 delivers input lag at 28ms, which is more than fast enough for the vast majority. Selecting Game Mode, which is required for that speedy response time, does horrible things to the rest of the picture settings, so you’ll want to tweak Brightness, Contrast and Colour Temperature in line with your preferences for the Standard mode. In fact, the Standard mode’s default settings are pretty much as good as the XF8505 gets. We switch off the noise reduction options and take a few points off Contrast for non-HDR stuff, but no amount of experimenting produced the blacks we were looking for without dropping brightness to unacceptable levels. As well as a lack of black depth to the picture, there’s also a lack of bass depth to the sound. This is not a weighty delivery, but the Sony does at least avoid the common trap of artificially boosting bass to fat and boomy degrees. Instead, what you get is a crisp and clear delivery with plenty of detail and a surprisingly wide soundstage. Of course, we’d recommend combining the XF8505 with a dedicated sound solution if possible, but the TV’s own sound is good enough so that you shouldn’t struggle to decipher dialogue from the latest episode of Poldark. There’s a lot to like about the KD-43XF8505, from the colours to the motion, the brightness to the standard-def upscaling. In fact, in many ways this is a five-star set. But some problems are so big that they cost a product not one, but two stars, and that’s the case with the backlighting of this Sony, which prevents the telly from producing anything like black. The result is images that are frequently grey and washed-out, and badly lacking in contrast. And this isn’t simply because the set uses an edge backlight. We’ve seen plenty of good examples of those over the years. Here, it’s simply because the edge backlight implementation is particularly poor. We’d expect better from a TV costing £400, let alone one with a £700 price tag.